Dremel smiled slightly, resting one hand on his surgical kit as he stood on the transporter pad and waiting. It felt...good, to get back out and start doing some good in the universe. There were only so many hours you could spent writing reports or editing papers before that itch came back, that Frontier Medicine vibe. There wasn't much known about the Horta, but what they did know didn't help them in the current situation. They aren't known for strong telepathic abilities, certainly nothing on the scale they'd seen; strong enough to debilitate every telepath onboard the ship. So whatever it was, whatever outside force had caused the Horta to retreat deep into the crust of Janus IV, was possibly something that hadn't been there before. Some invading intelligence? They'd find out soon enough. The Doctor smiled, settling into his element, and prepared to beam down. Dremel stayed knelt down, glancing between his Tricorder results and the Horta in front of him. This was the fifth one he'd gotten scans of now, and the results were the same in all of them. It had never occurred to them before, Starfleet Medical knew so little about the Horta anyway that it hadn't seemed important, but the scans didn't lie. These Horta weren't being poisoned, attacked, or killed...they were being starved. Starved by their own mining. They'd had a hundred damn years to figure this out! A hundred years of not caring because the Horta had always taken care of themselves and seeing as they mined just fine and survived on the rocks they dug through, nobody cared to worry about them beyond how much ore they dug out every damn day! He could feel the rage simmering away in his gut like a lead ball. Closing his eyes and taken a deep breath, he calmed himself slowly before looking around again, spotting D'Mera looking thoughtfully at one of the creatures. She had a good head on her shoulders, from the few encounters he'd had with her, but she was still somewhat naive when it came to space exploration. He'd heard her rock comment earlier, and wasn't quite sure how to take it. "Ensign D'Mera, come here a moment." He waited for her, watching as she looked up before sauntering over to him. "Yes, Doctor?". He pushed himself up and dusted off his knees again, then brought up his Tricorder and displayed the first two results for her. The first was a long wave of blue, like a DNA string, intersected at three equidistant locations across it's length. The second was similar, but larger, as if ten or twelve different strings of varying thicknesses and colours had been bound together to form a wave. There was a line of blue running through it, similar to the first reading. He watched her closely with a quiet smile. "Tell me what you see here." She was embarrassed. The sciences were never her best subject. She slung her phaser rifle over her shoulder and pressed it back as she leaned in to examine the tricorder. She hadn't thought to pull her hair back before she put the EVA helmet on, and now it was falling in her eyes. She tried shaking her head backwards to no avail. "Silicon based... The lower one is the Horta?" She bit her lip and muttered under her breath, but still loud enough so she knew Dremel would hear her, "maybe?" Her face looked braced, like a puppy that knew it might get the newspaper to it's nose. Dremel nodded, giving her a reassuring smile. "And the top one?" She took another look, reaching down and tapping hesitantly to confirm. "Pergium. That's an analysis of the chamber?" The Doctor nodded again with that same smile on his face. "And now if you take both results together?" She peered down at the Tricorder for a few moments, "The Horta...contain Pergium?" A grin flashed across the Doctor's face and he nodded enthusiastically. 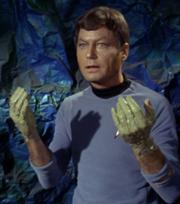 "This is a reading of the Horta taken over one hundred years ago, by Doctor Leonard McCoy of the original U.S.S. Enterprise. We always assumed that their physical makeup was a reflection of their surroundings, the rock they're made of is quite literally identical to the rock around us, only with lifesigns and a complex silica network of..." He stopped himself, once more not needing to go into details, then continued. "This is a reading I took a moment ago, what does it tell you?" Dremel tapped the tricorder and brought up his latest reading to replace the lower one. It was practically identical, except for no blue at all. "There's no Pergium in that one." D'mera's voice was a little more confident as she got to grips with the medical readout, so he smiled again and urged her on. "They...The Horta need the Pergium, it's not part of their body. It's nourishment. They're malnourished!" The Doctor's grin lit up his face and he nodded brightly. "Very good, Ensign. I'll make a medic of you yet!" Her face turned sour, in jest. "You could just shoot me." She mocked, as she unslung the phaser rifle and held it at the ready. "So, if they're malnourished, can we replicate some pergium and transport it into the cavern?" She looked with wide eyes towards the Bajoran doctor. He shook his head slowly. "It's molecular structure is too complex to replicate, which is why we have to mine it. This area of the planet seems to be absolutely devoid of Pergium, and the Horta can't seem to go very far without it. What we need to do..." He scratched his chin lightly..."First, the miners need to scatter the pergium they've already mined back through the rock here with the transporters. They could probably live off of that for a century or more, depending on how much is still on the planet, but we should look for either larger pockets elsewhere on the planet or even see about getting a large shipment transported here from one of the mines elsewhere in the Quadrant." Dremel turned to D'mera with a concerned look on his face. "We were starving them. We took their food and they didn't even know we were doing it, so now we need to do everything in our power to put it right." Feeling official, D'Mera shot back, "Isn't that the Captain's call?" She hadn't meant for it to come out so deflating. She knew Dremel's first concern were for these... Lifeforms. But she wasn't taking any chances with protocol, she'd only meant it as a reminder. 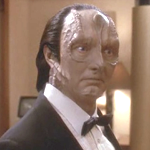 The Bajoran simply smiled. unphased and uninsulted. "Do you see the grey in my hair and the teal on my collar, Ensign? The welfare of the Horta, of any lifeform in need, is my domain. We may not have caused this personally, but we owe the Horta something, and if I have to i'll sit here and hand feed every single one of them myself." She couldn't help but smirk at his insistence. He was a good man, of that she was sure. Dremel's assistance with her innate Orion abilities had already endeared him to her. D'Mera almost told him he was sweet, but turned her face more serious and gave him a nod. "How could they have been mining for so many years without knowing they were essentially starving themselves?" He turned back to watch the Horta thoughtfully. "It happens; If someone took all of the Iron from your food, for example, you wouldn't notice it until you got sick enough to see a Doctor. There aren't Horta doctors for them to go to, so they did the only thing they could when they started to get ill..." He had to admit, it was fairly ingenious. He glanced over at the Betazoid standing there, waiting for the next command from the Horta. Perhaps not the most...diplomatic...of approaches, but they'd obviously been out of options. "Come on, Ensign. Lets get our Betazoid friend here back to normal and back up to the mines, then we'll have a word with the foreman." He glanced over to her, an almost mischevious smile on his face. "Put on your imposing face, just in case he doesn't want to play ball." James Greenman wrote: Feeling official, D'Mera shot back, "Isn't that the Captain's call?" Yes, yes it IS the Captain's call. But, she'd pretty much be on the same page as her fellow physician. Fantastic joint log, guys. Really nice exposition and character growth. Even if she wasn't, I'd love to see her go up against the bullheaded, stubborn physician that wants to help these Horta. Oooh, that would be fun to write! Pity she agrees. This time. "Doctor Kymar. The time is 0200 hours." The alarm chimed quietly while the Doctor worked, hunched over the readouts in Science Lab 4, ignoring it for now. He'd been watching the replicator make slow work of the isotope that they'd found in the Pergium, and soon enough they'd be able to start dispersing it through the rock for the Horta to feed on once more. It was a testament to the crew's abilities that they'd been able to get everything figured out and ready to go so quickly, and his chest swelled with pride at that. Some of them had been trained by him. "Doctor Kymar. The time is 0203 hours." The alarm brought him out of his short revery, smile dissipated to be replaced with a glower. "Acknowledged, Computer. Disable alarm." It chimed once in response then went silent. He stayed for a few minutes more as if clutching at a tiny victory, making sure that the replication was on schedule and putting the refining touches to the transporter dispersal patterns. He'd managed to use the scans taken of the Horta to calculate the optimum levels they required on a daily basis, cross referenced it with their known eating habits and factored in a short range to make sure any outliers were accounted for - overall it should ensure that the Horta in this part of the planet at least had access to the correct nutritional supplements. Maybe he'd write a paper on it. Unable to find excuses any longer, he uploaded his changes to the mission buffer and stepped out of the lab, heading for the quiet of his office. Gamma shift was always a quiet time. There were period when he missed the shift work, being Chief Physician meant that his shift was usually 'All The Time". But back in his younger days, Gamma had always been his favourite. It was quiet, relaxing, peaceful, some of his best work has been written on Gamma. His mind sifted through the old memories while he stepped into Sickbay, nodding to the staff nurse and then passing him to slip into the office. "Computer, illumination at twenty percent. Lock the door, authorisation Kymar Delta Nine Orange." One again the computer chimed in response, and the light level dipped at his request. It was always getting difficult to work in the bright light. Maybe he should have listened to the alarm sooner. Unstrapping his surgical kit, he placed it carefully on his desk and then took his seat. It was a comforting presence, the battered medical kit that was hooked to his shoulder practically wherever he went. He drew his fingers lightly across the scarred exterior, his face thoughtful, poised, as it usually was around this time. Shaking himself out of it, he opened it up and picked out a hypospray then activated the desktop replicator pad. "Computer. Access private medical files, Kymar Dremel." The computer blipped, the files flashed up on screen. His eyes scanned over the results by rote. "Select compound sixty-eight. Increase protein matrix density by three percent and replicate." He waited for a moment while the computer worked and the medical replicator produced the sample, watching it appear on his desk in a whirr of light before picking it up and slotting it into a hypospray. Leaning back in his chair he took a deep, slow breath, letting his heart beat slow and his muscles relax. Pushing up one sleeve, he revealed the flaky patch of blackened skin on his wrist, grimacing at the sight of it then pressing the hypospray down hard and pushing the injection key, holding it down while it hissed and released the burning fire into his bloodstream. The hypo clattered to the desk as he dropped it, clenching his fist and gritting his teeth, his eyes closed against the searing pain. He'd never truly get used to it, and it never really got any easier. How many years had it been now? "Computer..." his voice was already hoarse, and he forced himself to relax. "Computer, play...Nocturne One, Opus number nine...Andorian choral orchestra." The haunting melody filtered out into the room, and he relaxed further into his chair and let it wash over him. An hour, no more, and it would be over. Everything would be alright again. The music continued to play long into the early morning.